As Dragon Boat athletes we get asked a lot, “So what exactly is Dragon Boating?” We readily answer, no it is not like rowing and no, it is not quite like intense canoeing. Imagine two rows of ten paddlers lined up on a long boat, with a drummer in front shouting encouragement and a steers person at the stern calling commands. With over 2500 years of tradition, dragon boat is currently the largest flat-water and fastest growing sport in the world. During the year we train with dedicated coaches to build up strength and stamina through regular dry land practices, vigorous technique training by the pool, and endurance & speed on the track. This prepares us for our competitive summer season. All levels of experience are welcome; we train and grow together as a team. Hi there! 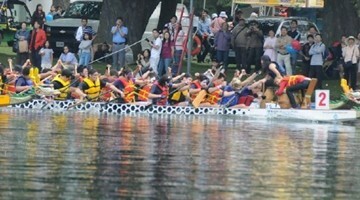 I’m Jeffery, the President of the Western Dragon Boat Club (WDBC) this year! I’m in my first year at Ivey, and I’m pursuing a double degree with computer science! I joined WDBC in my first year of undergrad and have been racing with the club for the last two years. During my time on WDBC, I have had the pleasure to be part of the executive committee as VP External Communications and Finance. WDBC is about fostering a welcoming and supportive community for individuals to connect with other athletes and has truly been one of the highlights of my university experience. Members are also trained to learn the basics of paddling and have the option to participate in weekly practices and attend our socials. No experience is required to join! Come by the Western Recreation Center to say hello! Trial Lake Practice: New members get a chance to get some hands on experience and paddle on a dragon boat on Fanshawe Lake in late September. Our experienced pool coaches and dryland coaches are there to teach the basic paddling techniques and run race simulations so you can get a taste of what our summer season is like! This is also a great way to meet our executive team and to meet other new members in the club! Paddling Seminar: Club members can learn the basics of dragon boating at our paddling seminar run by our very own pool coaches. Our coaches will break down, in a step-by-step manner, the essentials of paddling, the form WDBC uses to paddle and give tips on how to effectively pull water. We will have these seminars once a semester! Practices for the Winter 2019 term resume on Monday Jan 7 and conclude on Sunday March 31, 2019. * Please familiarize yourself with our Sport Clubs refund policy prior to any club registrations.